I am a big fan of half square triangles. I do not particularly like to sew them, but you can do such a variety of geometric patterns with them. Windblown Square is a good example. Stepping five steps back, you do not realise at first sight that this design consists of a certain arrangement of half square triangles. You think that you are looking at some rhombuses. Only on closer examination, or when you sew the block, you realise this simple “trick”. When having a closer look at another block, I realised that it is exactly the same pattern as Windblown Square. The only difference is the use of colours. I did not like to do two so very similar blocks. So I changed them both. 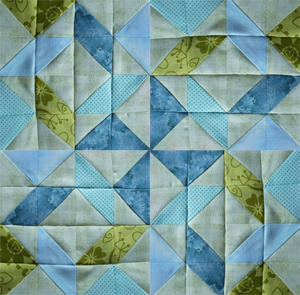 I used five instead of three colours for Windblown Square, and I rotated the corner triangles of the Whirlpo0l block. There you can see that by joining the blocks, a second pattern emerges: the blue pinwheel in the middle. Posted in Uncategorized and tagged farmer's wife, farmer’s wife quilt, quilt, quilt block, whirlpool, whirlpool block, windblown square, windblown square block. Bookmark the permalink. Your quilt is really beautiful. I’ve read all the related blog entries and loved the background “research” you’ve done regarding the blocks. 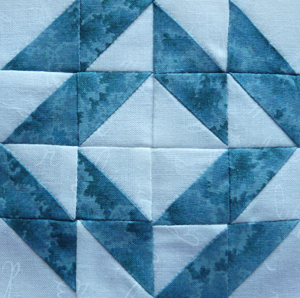 One question: did you hand sew or paper pieced or how did you sew your blocks? thank you, Elbé 😊 i machine pieced the blocks. i cut the pieces with my rotary cutter, after downsizing the original templates. but i like paper piecing and use this method whenever i think it’s best. 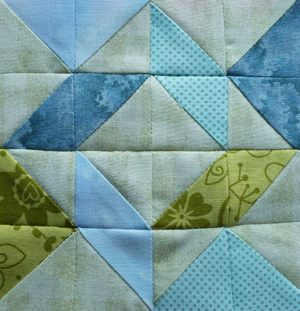 on the farmer’s wife quilt, however, i paper pieced only a handfull of blocks.